My little Rainy (age 6) is a bit of a reluctant reader...well, maybe not reluctant so much as she only wants to read if she knows she's going to get all the words right. If she knows the word, she's happy to read it; if she's not sure, she squirms and whines and tries to quit. So, I needed a fun way for her to learn more words and build confidence with the words she does know. You see, drilling the sight words isn't her most favorite activity. (Can you blame her?) Anyway, I don't know about you, but my kids loooove Go Fish, so I thought that would be the perfect! I picked up a couple of word sets from the teacher aisle at the dollar store. Don't make the same mistake I did, get 2 of each set during your first trip so you have matches for each word and can actually play go fish!! My sets required some cutting apart and such (dollar store, I got what I paid for) but any sight words flashcards would probably work great. Because the cards and big and the hands are little, we swiped the little shelf thingies from our Rummikub game to hold our cards. Handy and free, I like that. And the best news? Rainy loves playing!! She asks play and she reads her words (and even our words at the end) and she is becoming more sure of herself! Hooray!! Extra bonus? It's a card game, so Lilac (age 10) is totally willing to play, and-- AND!! 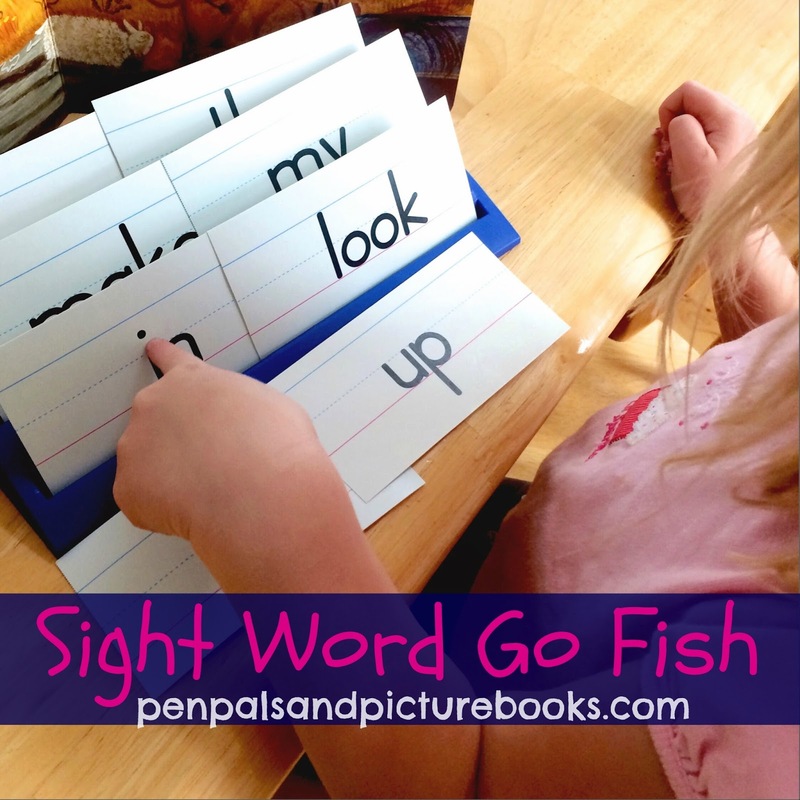 Cuteness (age 4) is seeing the words, hearing the letters and picking out some sounds! Happy pre-reading skills little lady!! PS- If I were using this set in a classroom setting I might laminate them for better wear and tear... and maybe put a little backing on so kids didn't try to see through.